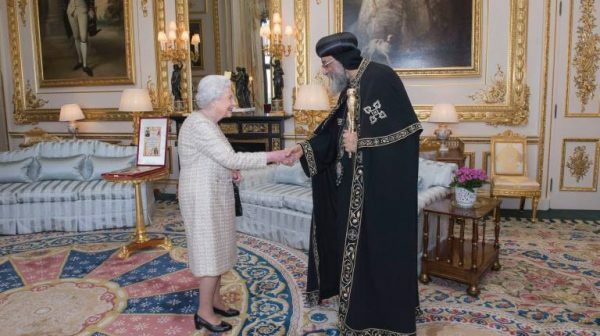 Queen Elizabeth II of the United Kingdom and Tawadros II, Pope of Alexandria, met on Tuesday at Windsor Castle, England. The meeting was also attended by Bishop Angaelos; General Bishop of the Coptic Orthodox Church in the United Kingdom; and Dean of Windsor, David Connor, according to a statement by the Coptic Orthodox Church of Egypt. The UK ambassador to Cairo, John Casson, in a statement on Twitter, described the meeting as “historic”. “The 66th Queen in 1,500 years receives the 118th Pope of Egypt in 2,000 years, two [figures] of wisdom and history in coexistence in an ever-changing world,” Casson added. The visit of Pope Tawadros II to the UK comes after his short visit to Italy in late April, where he attended the Egyptian Priests Conference in Europe, following his earlier visit to Kuwait. Tawadros was elected in November 2012 as leader of the Coptic Orthodox Church of Egypt.